The brother of US Masters champion Danny Willett has caused a storm on Twitter with his tweets as his sibling stormed to victory. One handed golfer hopes to play alongside Rory McIlroy and Lee Westwood. 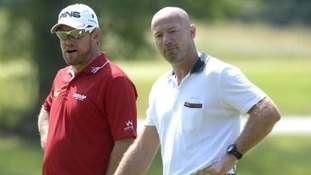 Former England football legend Alan Shearer will be playing golf in Derbyshire today - but he will only be completing one hole. He is taking part in a challenge to take on 18 holes across 18 different courses all over the country. He starts at his home course in Northumberland and finishes in Berkshire. The hole in Derbyshire will be played on the Breadsall Priory course, and he will be landing by helicopter. It is all in aid of the Alan Shearer Foundation charity, after a similar challenge last year raised £20,000. He is taking on British entrepreneur Feisal Nahaboo in a rematch, after beating him inside 17 holes last time. A blind golfer from Market Harborough has scored an incredible hole-in-one during a tournament. 71-year-old Jim O'Brien hit the hole-in-one on a 139 yard par three during the Peter Alliss Eye2Eye Challenge in Hindhead. His golfing partner and guide John Grindal helped him to take the shot. Jim, who has been blind since childhood, has played golf for 16 years. The English Blind Golf Association said he is only the third totally blind golfer who is known to have hit a hole-in-one. Some of the country's best golfers, past and present took to the greens today alongside famous footballers, cricketers and stars from the entertainment world. The British par 3 championship is taking place at Nailcote Hall in Warwickshire. Our sports correspondent Steve Clamp swapped his clubs for a cameraman and they were given access to the very best of the action - watch his full report. Warwickshire C.C.C coach Dougie Brown admits the weather has played its part in the Ashes and England will have to continue to play very good cricket to win it outright. Brown was speaking at the British Par 3 Championships at Nailcote Hall in Warwickshire which began today. Willie Thorne has been speaking about the rapid growth in the British Par 3 Championship at Nailcote Hall in Warwickshire. A number of celebrities have attended the tournament including Len Goodman, Jesper Carrot and golfing great Tony Jacklin. Len was taking part in the British Par 3 Championship at Nailcote Hall in Warwickshire. Len Goodman has been telling ITV News Central about his love of golf saying "the older you get the better you used to be." The 'Strictly Come Dancing' star was speaking at the British Par 3 Championship at Nailcote Hall in Warwickshire - the third biggest golfing event in England.